Your health is influenced by where you live. Where you live is made up of many physical, social, and cultural factors. The relation of these factors to health can be seen with almost every heath issue that Duval County faces. 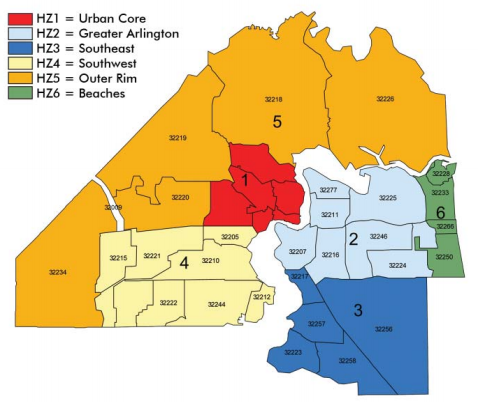 The Duval County health zones are made up of zip codes. Duval County is unique in that it comprises urban, suburban and rural areas. Health Zone 1 is considered to be the most urban area with a population density of 2766.5 people per square mile while Health Zone 5 is considered to be the most rural area with a population density of 177.1 people per square mile. Duval County’s population is 61% white, 29% black, and 10% other races with more than 7% of the population having Hispanic ethnicity. Health Zone 1 has the largest percentage of minority population (81%), while only 16% of the residents of Health Zone 6 are minorities. Keepin’ It Safe Jacksonville focuses on the populations in Health Zone 1, Health Zone 5, and Health Zone 6.